Invicta FC 17: Evinger vs Schneider / Souza vs Hill Photos » MMA H.E.A.T. On Friday, May 7, Invicta Fighting Championships hosted Invicta FC 17: Evinger vs. Schneider from The Hangar at OC Fair & Event Center in Costa Mesa, California. The eight-fight card streamed live and exclusively on UFC FIGHT PASS. Invicta FC bantamweight champion Tonya “Triple Threat” Evinger (18-5) successfully defended her belt against No. 1 contender Colleen “Thoroughbred” Schneider (10-7). 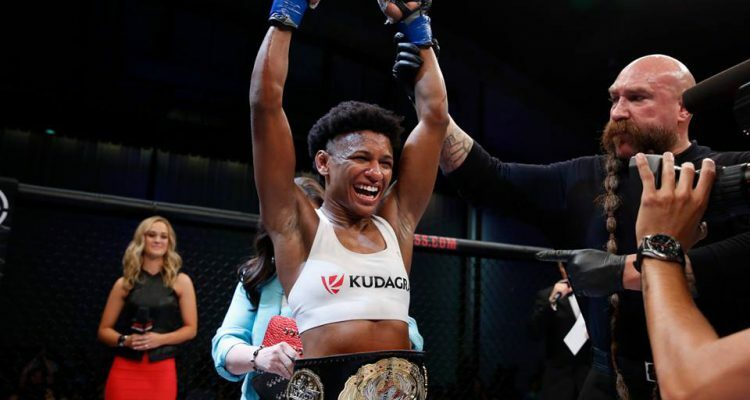 UFC veteran Angela “Overkill” Hill (5-2) defeated unbeaten Livia Renta Souza (9-1), becoming the new Invicta Fighting Championships Strawweight Champion. No Comments on "Invicta FC 17: Evinger vs Schneider / Souza vs Hill Photos"